Arrive in Cambodia and prepare yourself for the adventure of a lifetime. Explore all of the highlights Cambodia has to offer and support Feeding Dreams Cambodia’s 1,000 impoverished children and their families. 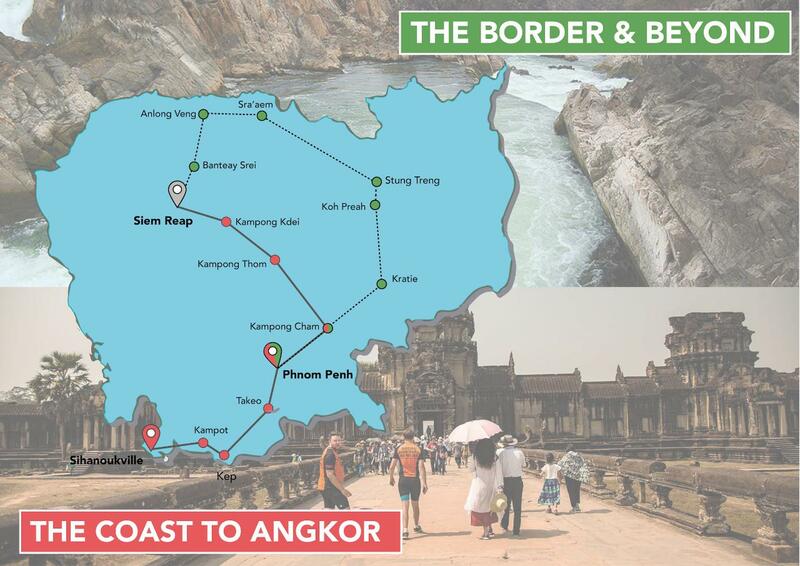 The Border & Beyond (10-Days / 8-Days cycling): Depart the nation's capital and journey truly off-the-beaten-track into Cambodia's northern reaches. This trip steers clear of well-worn tourist trails, as we follow the Mekong North we will pass hundreds of islands, if we are lucky we might sight a rare endangered Irrawaddy Dolphin and when we hit the border of Laos we will see the epic Mekong Falls with rapids cascading down into Cambodia. Immerse yourself deep in the genuine Cambodian experience - A new route for Feeding Dreams, but one we've designed from years of experience here. The Coast to Angkor (10-Days / 8-Days cycling): Cycle from the southern coastal beaches of Sihanoukville past small fishing communities and untouched villages to the spectacular temples of Angkor. This is our classic route, that's a time-tested favourite, now on its 3rd run. You'll enjoy a large selection of Cambodia's iconic highlights and experience some lesser known gems along the way. Dare to Double? For the true go-getting two-wheeled explorers, why not challenge yourself with both trips! You couldn't find a more comprehensive and exciting way to discover this amazing country and a greater sense of achievement at the finish line. Please select your choice of route and save your spot on the road.